[Corrected 5/21/14, 8:53 am. See below.] Movie and TV series addicts have Netflix. Adventurous music aficionados have Pandora. But there’s arguably no equivalent go-to mobile app or software program for people who are planning a fun night on the town and want help scouting bars that match their tastes and mood. That’s what the makers of SpotHopper say they’ve created. The app, which recently went live in Milwaukee, helps users search for a nearby bar, club, or lounge that closely mirrors their preferences, and then recommends specific beers, wines, or cocktails available at those venues. The app also displays current drink specials. Co-founders Aleks Ivanovic and his son, Niko, got the idea for SpotHopper in 2012 while traveling. They were frustrated that they couldn’t find something that helps people visiting a new city to quickly and easily find a watering hole that’s just right for them—without the typical hassle and time wasted on Web searches and sifting through blogs and online reviews, Ivanovic says. Ivanovic’s 22-year-old son is a “big beer geek” who scored high on the MCAT exam, but has dropped plans for medical school in favor of working on SpotHopper, his father says. “My wife was not very happy,” Ivanovic says. Ivanovic has self-funded SpotHopper so far, and he hasn’t decided if the company will seek outside investment. The startup has set up shop in 96square, the downtown Milwaukee coworking space, and intends to expand the app’s capabilities to Madison, WI, followed by New York City and Denver, Ivanovic says. The app is free to download, and the startup will make money by charging restaurants, bars, and beverage makers to be promoted in searches. But sponsor venues and products would only show up in a search if they matched a user’s criteria, Ivanovic says. This means that if two beers are a 92 percent match for a user’s preferences and one is a sponsor, the sponsor will show up higher in the search results. 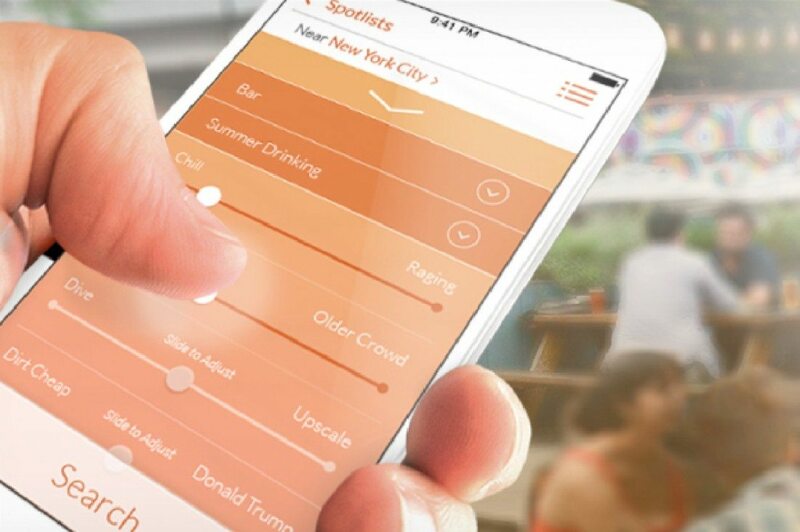 In addition, SpotHopper will be able to send push notifications to users advertising nearby drink specials in real time, only charging venues a fee for each customer lured by those targeted ads. SpotHopper will likely expand its concept and technology to dining next, Ivanovic says, but first it must conquer the bar scene. SpotHopper’s proprietary algorithm will be a differentiator as the company tries to stand out amongst the myriad bar apps on the market, Ivanovic says. (There are a bunch of apps in this space, although I haven’t come across one trying to tackle the same problem in exactly the same way as SpotHopper. The closest competitor I’ve found is UrbanDaddy’s The Next Move.) Most apps search for bars based on keywords, Ivanovic says, but SpotHopper’s algorithm spits out matches from a series of traits stipulated by the user. And the program theoretically should produce better matches the more it gets used because it incorporates user feedback, Ivanovic says. For example, if someone tries a particularly hoppy beer and gives it a much lower hoppiness rating than the average SpotHopper user, the app will adjust its future recommendations for that person based on its interpretation of his or her palette. “We believe we will really get you the best match out there for exactly what you’re looking for, both in terms of flavors and vibe [of the venue],” Ivanovic says. After creating a free account, I indicated I was looking for a bar/restaurant and was presented with choices for the temperament of my dream bar/restaurant, ranging from “let’s rage” to “cozy wine bar.” I picked “summer/day drinking” because Milwaukee was finally enjoying near-70 degree, sunny weather on this Sunday afternoon, and I wanted to sit outside.